Having crossed the MLB Competitive Balance Tax threshold for the first time possibly in 2017, the luxury tax will start to have a major impact on the Nats’ payroll decisions in the upcoming years, that is a fact. What that impact will be is up for speculation for all of us who aren’t on the team’s board of directors. How will the tax affect the 2018 payroll? How with the Nationals plan for the impact for the future beyond 2018? And of course, how will the tax affect the teams ability to retain Bryce Harper? The tax runs from minimal at first to extremely expensive in both fees and draft picks. For the Nats last year it was only a 20% penalty on the team player expenses exceeding $195 million, reportedly a fairly small amount. However, if the Nats continue to exceed the limit the percent will rise to 30% in 2018 and then to 50% in 2019. Dropping back under the threshold for one season is sufficient to reset the fees back to the 20% level for the next season. For teams exceeding the threshold by $20 million there is an additional 12.5% fee on the overage, and then up to 45% for the excess amount over $40 million, a whopping 85%. Those limits include player payroll as calculated at the “average annual value”, meaning that all of the Nats’ deferred contracts are counted towards the cap within the actual term of service rather than the extended years when payments are made. They also include “player benefits”, estimated by Cots Contracts to be $13.5 million per team for 2018, but not publicly known, making it impossible to know just how far over the Nats were last season. As it stands, Cots estimates that the Nats will be $3.7 million under the cap for 2018, which factors in raises for players in their arb and pre-arb years. Interesting thing about the MLB defined player benefits is that it includes medical expenses, so once over the cap the Nats had to pay a 20% premium for every MRI. For a first time offender the cash penalty is negligible impact, the much bigger issue is the potential loss of draft picks. If the Nats sign a player who has been made a qualifying offer they will lose their 2nd and 5th round draft picks, signing a second such player would cost them their 3rd and 6th round picks, pretty hefty penalties. In addition, if the Nats make a qualifying offer and have the player sign elsewhere, they will only receive a 4th round compensation pick instead of a 2nd rounder. All of that sounds really bad for the Nats having hit the threshold, but there is a bright side. Overall MLB salaries are rising at a much faster annual rate than the threshold, so there is a rapidly increasing number of teams in the same position. Also, the draft pick penalties cut both ways, meaning that other teams will be equally reluctant to take on big salaries. Here is some additional info from Steve Mears, Chelsea Janes, SI, Jamal Collier, Craig Edwards from Fangraphs, and Tigers blogger Patrick O’Kennedy. We haven’t mentioned it as a factor, it has not been a deterrent. 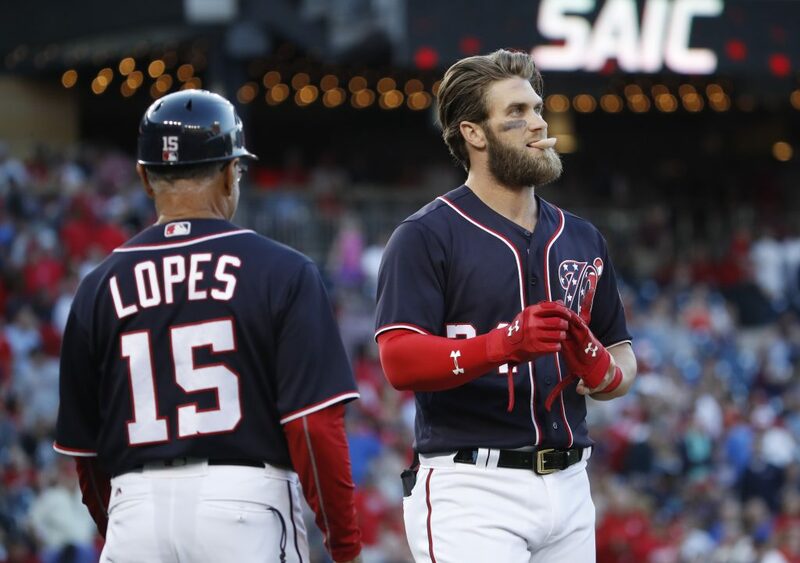 Bryce Harper’s pending free agency is the 400 pound gorilla that will determine how the Nats approach 2018, almost certainly forcing the team to stay below the cap. Assuming the team doesn’t sign him long-term, they probably don’t want to lose the 2nd round compensation pick. On the other hand, if they do sign him to a mega contract starting in 2019, they’ll want to have the tax rate drop back to 20% and 30% for the first two years as the threshold gradually rises. So for the upcoming season Rizzo will need to fill out his bench and bullpen on the cheap, under $3.7 million total, unless of course he makes a trade to dump salary (Zimmerman). Long term, if the Nats exceed the cap, it will factor into every signing, particularly if they hit the 50% mark. Imagine a $400 million contract for Harper, it would put the Nats over the threshold for years, probably by $20 million. So instead of $400 million the Lerners would be paying out up to $500 million. As much as I curse DC speed camera fines, I wouldn’t blame the team for passing on a $100 million fee. With an increasing number of teams hitting the threshold and treating it like a cap, over the next few years there will be a more pronounced difference between the big spending teams and the rest of the league. Teams that don’t want the double whammy of tens of millions in fees plus lost draft picks will become much tighter with their free agent money. Young players, in their prime years, and under 6-7 seasons of team control will become even more highly valued. Veteran players hitting free agency will likely have to tighten their belts and wait until the next CBA. This entry was posted in Harper, Lerners, MikeRizzo and tagged Bryce Harper, rizzo, Washington Nationals. Bookmark the permalink.